It usually gets quite frustrating when your project requires a lot of sensors or, and your jumper wires are also in a mess. To help you get rid of breadboards and jumper wires, Base Shield has been introduced. 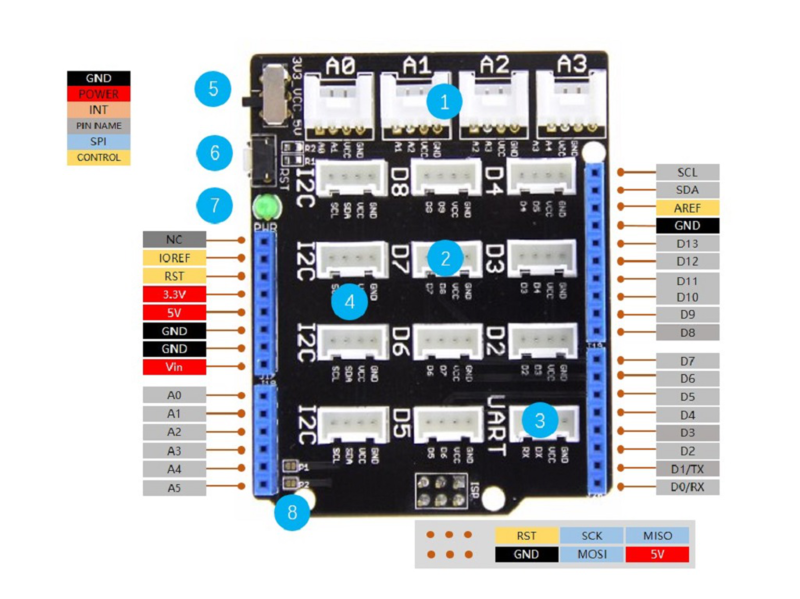 This can help you add all the grove modules to the Arduino Uno conveniently. Grove products can be conveniently used together with an expansion board know as Base Shield v2. 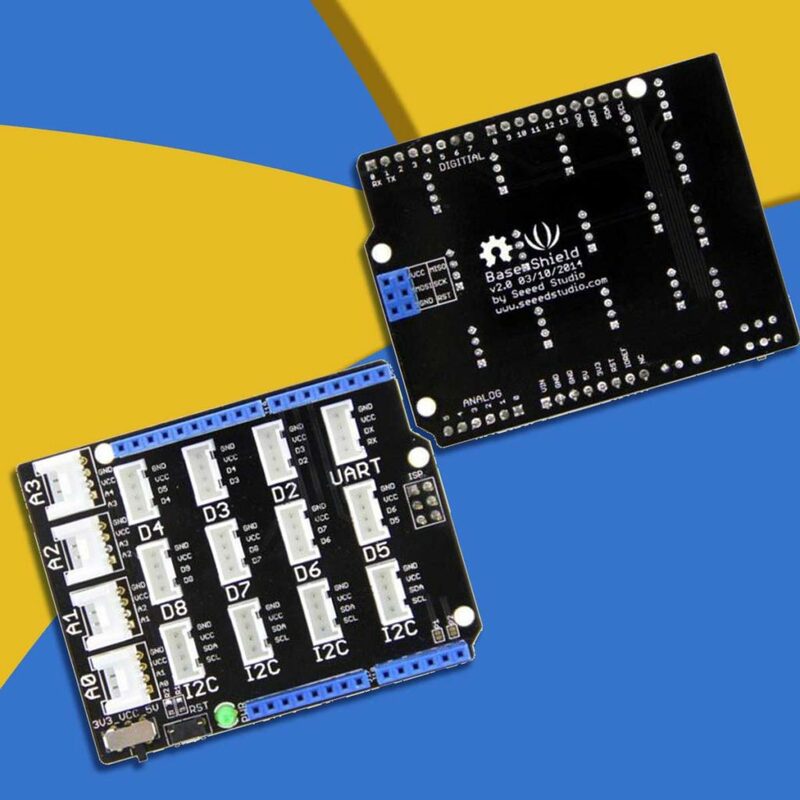 It eases connection and is compatible with a series of Arduino products. 1-Analog Ports: include 4 analog ports, A0, A1, A2 and A3. 2-Digital Ports: include 7 digital ports, D2, D3, D4, D5, D6, D7 and D8. 3-UART Port: 1 UART port. 4-I2C Ports: 4 I2C ports. 5-Power Switch: when using Arduino UNO with Base Shield v2, please turn the switch to 5v position; While using Seeeduino Arch with Base Shield v2, please turn the switch to 3.3v. 6-Reset Button: reset the arduino board. 7-PWR LED:The Green LED turns on when power on. 8-P1, P2: please solder the pads P1 and P2， if use Base Shield v2 with Seeeduino V3. The number of pinouts is the same as that of Arduino UNO R3. Added SDA and SCL pins that are near to the AREF pin and two other new pins placed near to the RESET pin, the IOREF that allow the shields to adapt to the voltage provided from the board. In future, shields will be compatible with both the board that uses the AVR, which operates with 5V and with the Arduino due that works with 3.3V. The second one is a not connected pin, that is reserved for future purposes. Bring all your Grove products together with Base Shield. The most popular Arduino board so far, where you can add all the grove modules very conveniently.